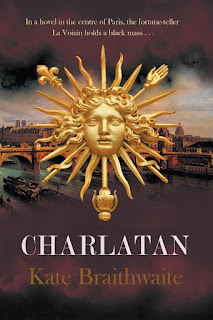 Almost two years ago, I interviewed Kate Braithwaite on New Books in Historical Fiction about her first book, Charlatan, a gritty and engrossing novel set during the Affair of the Poisons—an intrigue that touched, among others, the aging and soon-to-be replaced marquise de Montespan, mistress of Louis XIV. A month ago, I discovered that Kate was back with a new book, not too distant in time from the first but set across the English Channel, where the imminent death of Charles II has aroused fears that the ascension of his Catholic brother, the future James II, will reignite the religious wars in England. But Kate can explain the rest of The Road to Newgate herself. Kate, welcome! Although set in the same century as your previous novel, Charlatan, you’ve moved north for this one. It’s nice to see a book about the later Stuarts—rather than the Tudors, who get so much attention—but what drew you to this particular setting? I stumbled across this story while researching Charlatan, and both novels are not only set in the same century but in the exact same few years, roughly between 1678 and 1682. While Paris was in turmoil with a poisoning scandal, London had a very different kind of upheaval, when one of the most infamous liars in history, a man called Titus Oates, created a major panic with revelations of Catholic plots to assassinate Charles II. What’s the story, in a nutshell? 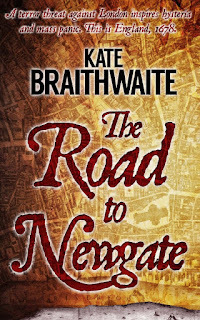 In The Road to Newgate, a married couple, Nathaniel and Anne Thompson, get caught up in the events of Titus Oates’s Popish Plot. 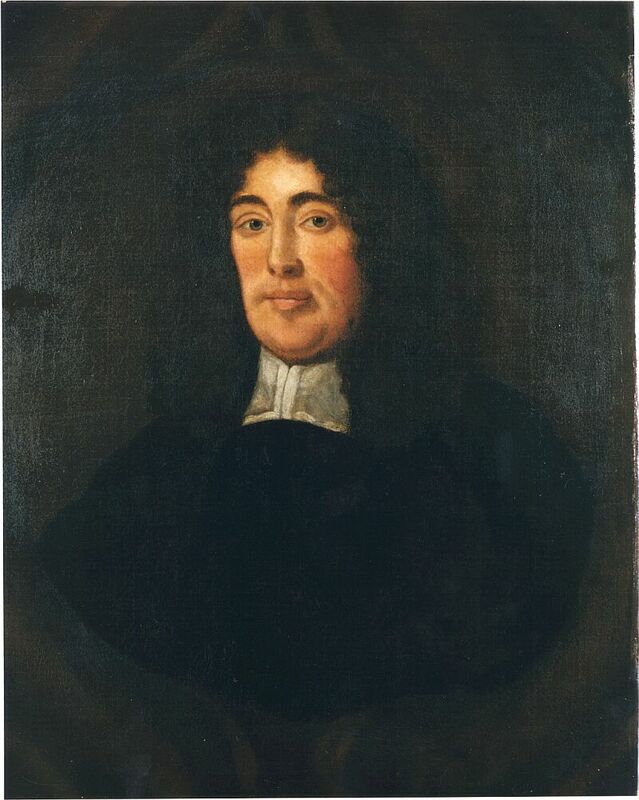 A Protestant magistrate is found dead in a ditch, sparking mass panic, but Nat, a writer, doesn’t believe the plot stories and becomes determined to prove that Titus Oates is a liar. Oates, a dangerous enemy to make, is also connected to the Thompsons through their friend William Smith, a man with a secret he is afraid to share. The story is about Nat, Anne, and William: about what they must do to expose Oates … and what it will cost them. Your main character is Nathaniel Thompson. Tell us a bit about him: who he is and what he wants from life. Nat is clever, hard-working, and stubborn. He’s a man who has achieved a good position as Licenser to His Majesty’s Press and has done so without the benefits of a rich family or connections pulling strings for him. He has recently fallen for and married Anne, ten years younger than he is, and when the story begins, he is still adjusting to this new life where he has someone else to care for, other than himself and his work. He is not always the most sensitive soul and has a lot to learn as a husband! Although Nat’s decisions are made in good faith, the cost of his choices—costs borne by his family and friends—may be hard to bear. Nat’s wife, Anne, is also a major character. What’s her background and her role in the book? Anne comes from a different, more affluent background. She is the younger of two daughters and has married Nat in the face of family opposition. But having married the man she loves, she finds life more challenging than expected. Once the novelty of running her own household wears off, she struggles to find her feet. Nat is busy, and she is often alone. She wants to understand his work, but she has her own views and the couple don’t always see eye to eye. With Nat caught up in public events and bringing danger to their door, Anne has to find a way to assert herself in her marriage and take an active role in the events that unfold if she is to have the life with Nat that she imagined when she married him. Nat and Anne have only recently married, as you mentioned, and Anne, as we learn early on, has reason to believe that she will soon have a child. That’s a lot of transition to deal with, and the events of the novel only increase the pressure. What do their varying—and developing—points of view contribute to your novel? The challenge in this story was making the public, historical events personal to the characters. The Popish Plot is complex and political, but I was interested in looking at how a public crisis could affect ordinary people. By telling the story through Nat and Anne’s points of view, I hoped to personalize the public drama as it unfolded. I enjoy stories where I can read different characters’ perspectives on the same events. Nat always doubts Titus Oates’ plot stories, but Anne’s reaction is more in line with the majority of Londoners. The pressure on the marriage—the threats to Nat’s income, the pregnancy, Anne’s doubts about Nat’s actions—is a very important theme. A key part of the story is a murder investigation, and it was vital that Anne take a role there. The ability to switch into her point of view was essential to telling her story—I hope—convincingly. William Smith’s point of view and his story are integral to the plot but also add to the reader’s understanding of Nat and Anne’s characters and marriage, when we see them through an outsider’s eyes. I was also keen to portray Titus Oates on the page, and each of my three storytellers have important confrontations with him at various points in the book. There is a certain contemporaneity, as Russians say, to this whole web of plots and conspiracy theories and counter-plots. Do you see echoes of this past in our present, and if so, where? More generally, what would you like readers to take away from The Road to Newgate? I definitely see parallels to the world in 2018 in the story of The Road to Newgate. The explosion of propaganda, the terrible rhetoric against Catholics, the way Oates’ lies are so fantastic that people find it easier to believe he is telling the truth than imagine that someone could have made it all up—all these things resonated with me as I wrote. That said, this is a novel. My main aim has always been to write an entertaining, page-turning book. There are themes to think about and connections to be made; it is also a lesser-known slice of Stuart history that I’m excited to shed some light on. But these are not the most important take-aways. Above anything else, I’m hoping readers will care for the characters and get sucked in to wanting to know what happens to them. Oh, and want to read my next book! Are you already working on another novel? I am, although slowly! With a book launch and children off school for the summer, I’m not getting along with my next project quite as quickly as I’d like. But it does have a title —The Girl Puzzle—and it’s about Nellie Bly, a groundbreaking female journalist. There are two storylines at the moment, one of her as a young woman starting her career in New York City in the 1880s and a second later in life, in her fifties when, in the first scene, it seems she has just kidnapped a child. Sounds fascinating. I look forward to finding out more. Thanks so much, Kate, for taking the time to answer my questions! Kate Braithwaite was born and grew up in Edinburgh, Scotland. 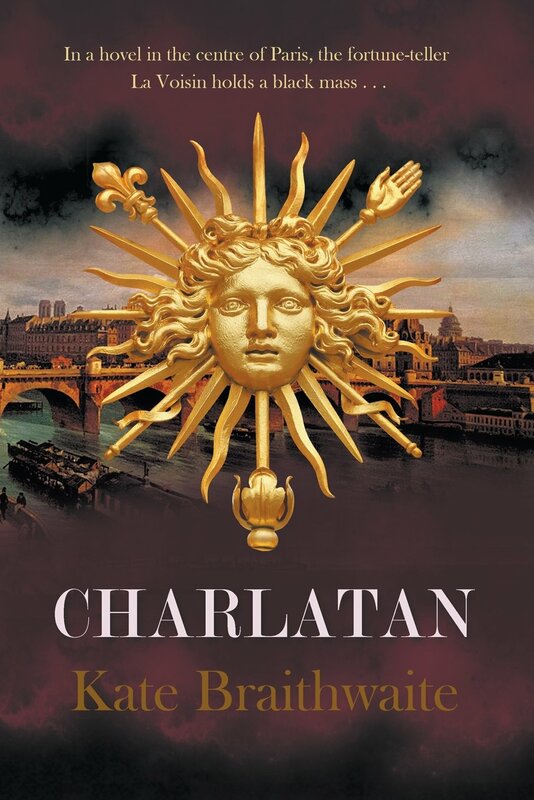 Her first novel, Charlatan, was long-listed for the Mslexia New Novel Award and the Historical Novel Society Award. Kate lives in Pennsylvania with her husband and three children. Follow her on Facebook and Twitter, or find out more about her at http://www.kate-braithwaite.com. She also maintains a second, light-hearted blog about the differences between US and UK English. And on another note, for those who’ve been waiting, The Shattered Drum is now available for both print and Kindle and as part of my second Legends box set, which also includes book 4 (The Vermilion Bird). 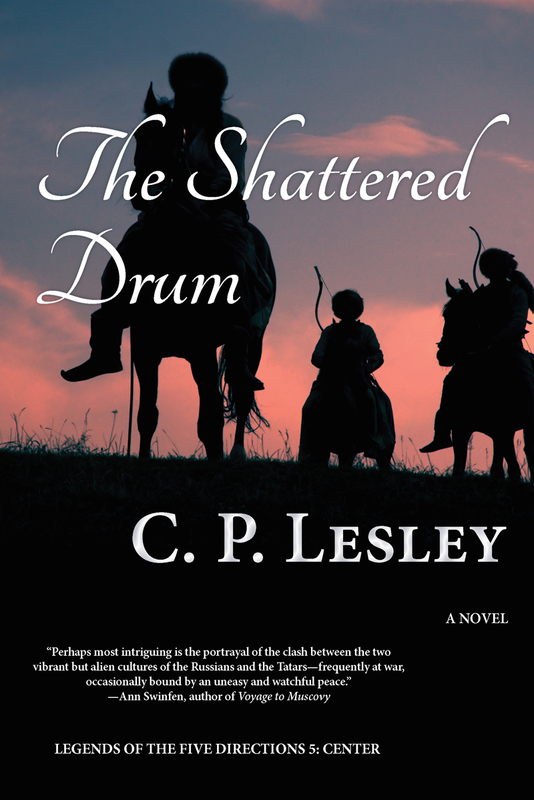 Click on the titles to access the various editions, and check out the links at http://www.fivedirectionspress.com/the-shattered-drum and http://www.fivedirectionspress.com/boxsets, respectively, for more information.